Great Dane Skull. Canis lupus familiaris. 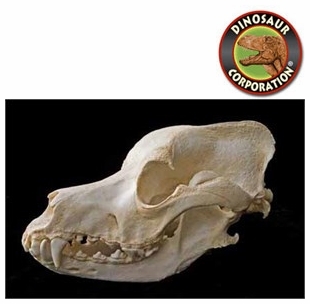 Great Dane skull replica is cast from original specimen. First bred in Germany. Used to hunt Boar and Stags in the 17th century, 100-120 lbs, CAS specimen. The Great Dane is a breed of dog known for its giant size and gentle personality. The breed is commonly referred to as the "Gentle giant". Great Danes are among the tallest dog breeds, along with the Irish Wolfhound; as of 2007, the world's tallest dog is a Great Dane.